Days after a former doctor opened fire at a hospital in the Bronx, one doctor injured in the shooting was released from the hospital as the condition of five other victims was upgraded. Marc Santia reports. The six surviving staffers of Friday's rampage shooting at Bronx-Lebanon Hospital all suffered "horrendous injuries," including assault rifle wounds to the head and neck, but their conditions are improving - a testament to the heroic effort of the trauma teams to keep them all alive, officials said Monday. A physician shot in the neck when 45-year-old former employee Henry Bello stormed the facility, an AM-15 rifle hidden under a white lab coat, was discharged from Bronx-Lebanon on Monday afternoon, authorities said. Oluwafunmike Ojewoye, 29, is a family medicine doctor at the hospital. 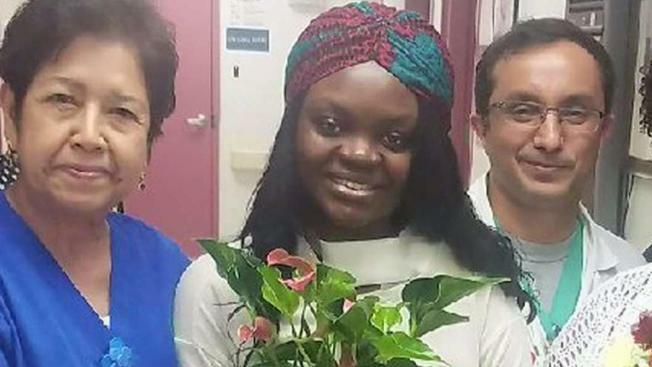 A photo provided to News 4 on Monday shows Ojewoye with hospital staff and others as she is discharged from the hospital. Three others remain hospitalized there but are in stable condition. Two are out of the intensive care unit, while the last patient remaining there is eating and walking around, officials said. A medical student hospitalized at Mt. Sinai with a brain injury has been taken off a ventilator and is in good spirits. Hospital staffers and nurses who worked on the victims described a herculean effort to save lives. One life, though, could not be saved. Tracy Sin-Yee Tam, 32, usually worked in the clinic but was covering a shift at the main hospital as a favor to someone else when Bello, bent on killing a doctor sources said he had blamed for getting him terminated from the house physician job he held at Bronx-Lebanon from August 2014 to February 2015, used his old ID to gain access to the building and opened fire. Friends of Tam have raised more than $22,000 toward the young woman's funeral expenses as a memorial for the physician grows outside the Queens home she shared with her mother. The GoFundMe page popped up Sunday. By 11 a.m. Monday, the page had raised $22,930, 92 percent of its $25,000 goal. A doctor who worked with Tam closely for years and went to medical school with her created the page, calling her "an exceptional, and an extremely compassionate physician" who "touched the lives of many." "She worked extra hours without incentive just to hold hands of patients that are about to pass or just to talk to them and listen to their needs," friend and colleague Ahmed Rezk wrote on the page. Tam died when Bello, enraged that a specific doctor he had asked for was not there, opened fire. Bello shot himself to death on the 17th floor of the hospital after failing to set himself on fire. Oluwafunmike Ojewoye, 29, was discharged from Bronx Lebanon Hospital on Monday afternoon. NBC 4 New York exclusively reported Bello had been fired from a city job a week before the shooting spree. The latest termination was another setback for Bello, who had recently moved out of a men's homeless shelter on 30th Street in March and into his own apartment.